Summers are specifically the most blistering season in India. And it is going to difficult to bear the scorching heat year by year in the summers. Well, technology has gifted so many useful gadgets to get relief from the sizzling heat during summers, Air Conditioners are the best way to get instant relief in the hot summers. But for any middle-class family, it becomes very difficult to afford the high electricity bills if they only rely upon Air Conditioners. And that’s why we tend to look for the most cost-effective options. Here comes the role of Air Coolers, Ceiling Fans, Table Fans, and Pedestal Fans. 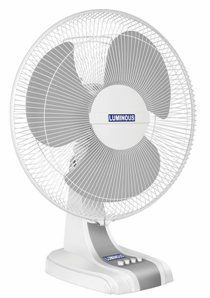 And this blog is all about the best table fans for your home and office use to beat the intense heat of summer. Nowadays Table Fans come with the most sophisticated and stylish look rather than the traditional models and also with the most cost-effective budget. So it is better to have at least one table fan to own. The table fans are the affordable option and great enough to cool rooms along with the great ventilation to every nook and corner of the room. The very best is that they are compact and portable, so you can easily move it from one room to another. 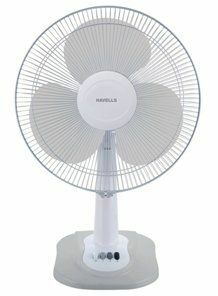 Some of the table fans come in wall mountable model that you can easily mount on your room wall for excellent cooling. There are numerous factors you must consider before buying a table fan. A lot of models are now available in the market, each slightly a little bit different from one another. So, go through the following points that will surely make your buying decision easier. Size is the most important factor while purchasing a table fan. 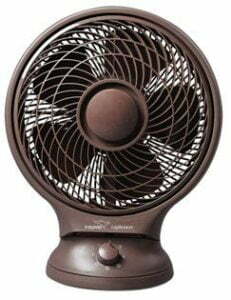 Generally, Table fan comes in 3 distinct sizes 12, 16, and 20 inches. And it is preferable to choose the large one. The larger the table fan, the quieter is its operation. And also, the larger fan at low-speed setting is quieter as compared to the smaller table fans at high-speed setting. 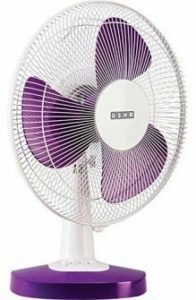 Checking for the noise level is another important factor if you are considered to purchase a table fan. So always go for the one having high motor power as well as the great quality table fan. 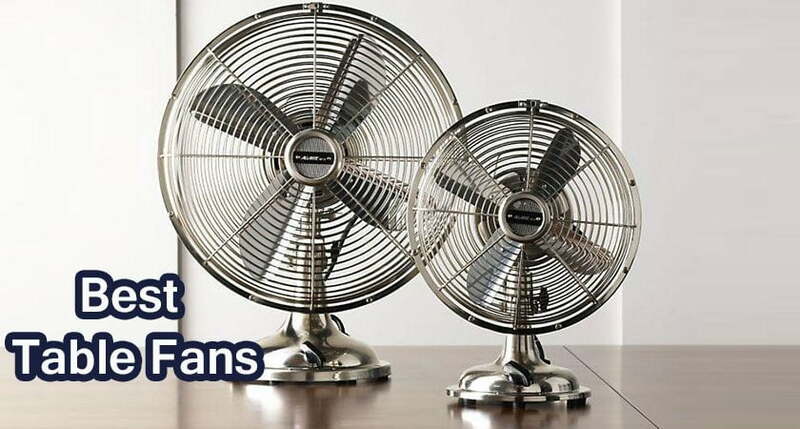 The table fan having low-grade motor causes a lot of noise which is seriously irritating. The second thing we have already discussed in the above point is that opt for the bigger models for less noise. Choose the table fan having a detachable grill. This factor ensures that you can clean it very easily as for continuous use; the dust and other particles are stuck on the blades of the fan. You all must want a table fan that offers the best cooling. Some of the models come with rotating or oscillating grills that let you swing the fan in any direction you want. And thus cool air flows in every direction. If space is a constraint, you can go for the table fans that are wall mountable. You can easily make it fix on the wall and enjoy cooling in every direction. 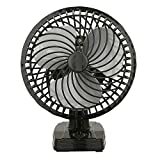 So, are you planning to buy a new table fan for your room, or want to replace the older one, the ultimate guide presenting in the blog will help you in every manner. We have rounded up here the 7 best and latest models of table fans that will give you the utmost cooling experience. All these table fans we have listed are also very budget-friendly. So just have a look at the below-listed model of table fans and pick the one accordingly. High performance with amazing features is all about this table fan from Usha. It comes with a powerful motor and aerodynamically designed transparent blades that give the best airflow. 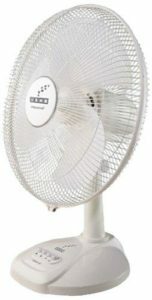 This table fan has four-speed control system that you can use accordingly to set the speed of your own choice. The very best is its oil reservoir lubrication feature ensuring reliability and long life of all the fan components. This model of the table fan from V-Guard is the smaller one, but in terms of performance, it comes on the second of our list. Great features with great utilities is all this small table fan boasts about. This fan has three adjustable speed settings that let you adjust the speed according to your convenience. Also, it comes with an oscillating function and has a rotating grill for uniform air delivery. This table fan from Usha is a perfect combination of performance and style. Getting a cool breeze anywhere in the house is now easy and cost-effective with this table fan. It offers efficient air delivery for the better cooling experience. The aerodynamically designed 3 leaf PP blades offer efficient cooling. The very best is its compact design and portability that makes it easy to carry anywhere. This table fan also comes with 3-speed settings that let you control it accordingly. Modern aesthetic look with elegant high air flow is all about this fan speaks about. Although it is a small table fan but in terms of performance, it will definitely be the best buy. It comes with an adjustable head setting that you can easily set according to your convenience for perfect cooling. The powerful air delivery ensures the efficient cooling in your room. This table fan also has a clasp grill for easy maintenance and cleaning. This smart wall mountable fan is perfect enough for best cooling. 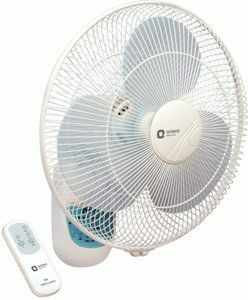 The remote control operation makes this fan even more convenient and smart to use. You can also control it manually through its high-tech touch button. This wall fan is equipped with a powerful motor that ensures high air delivery. The aerodynamic blades are designed for better air thrust. With a modern design and contemporary look, this table fan is a perfect choice to get an amazing cooling experience. This table fan comes with a strong structure supporting its functionality. It has three blades for better air thrust. Also, it comes with 2 pole capacitor type motor that is very efficient and gives strong air delivery. The very best is that it consumes very minimal power. This one is the perfect choice for both home and office. 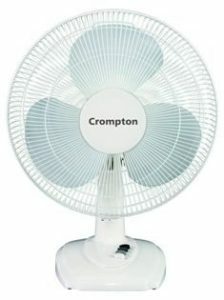 The Crompton High Flo Eva is the compact and portable table fan and is very easy to use. It has an ideal air circulation system that offers amazing cooling experience. This table fan has 4-speed settings for your convenience so that you can easily set the speed accordingly. 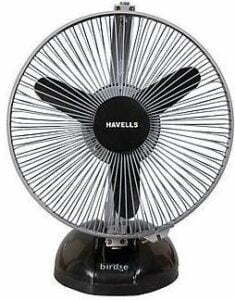 This stylish, elegant, trendy, and portable table fan from the brand Havells is also a great buy for your home. The Havells Swing ZX comes with a 400 mm sweep that offers you a powerful airflow and a directional high performance blowing. Plus the air flow reaches each and every tiny corner making the whole room filled with the cool breeze. And the very best part is its taller base stand that allows the enhanced airflow to reach every corner. This table fan is equipped with three aerodynamically designed blades for more and enhanced airspeed and reach. And as a bonus, it also comes with Thermal Overload Protector to protect the motor in case of high voltage fluctuation. 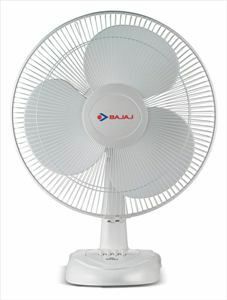 The next is this model of Bajaj Table Fan with its smart features and superb performance. This table fan is equipped with a powerful motor for better and enhanced air delivery. Plus the ergonomically designed three blades make the air flow more powerful. This one not only enhance the aesthetics of your room but its 50 W power consumption makes it the best energy efficient model that saves a lot on your pocket. 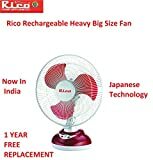 The fan delivers cool breeze to every corner in the room and thus now don’t need to worry about the scorching summers if this fan is with you. As a more convenient feature, this table fan comes with two-speed settings that you can change accordingly. 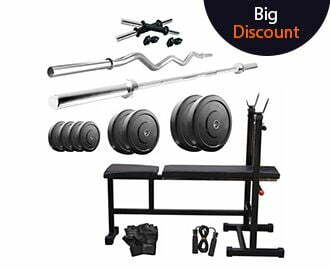 Moreover, the price is also very reasonable that anyone can afford it very easily. And the last is Mojo Plus table fan from the brand Luminous. It offers you the utmost comfort and relaxation during summers by providing the cool breeze all around the room. Its aesthetic design adds a great appeal to enhance the overall look of your room. And when it comes to air flow, this table fan offers the outstanding performance. This one comes with three blades along with the sweep of 400 mm that efficiently generates a cool breeze to provide you the feeling of comfort. And the adjustable three-speed settings allow you to operate the fan on the desired and convenient speed level. 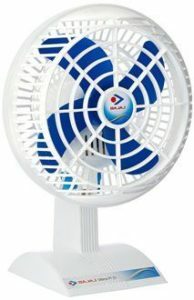 This is all about the best and latest models of table fans that will offer the best cooling in your room. Choose the one according to your preference and budget without worrying about the electricity bills. And feel free to share your comments and suggestions if any, in the comment section below.